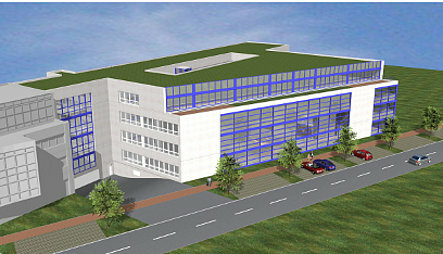 PI is building a Technology Center at its headquarters in Karlsruhe. The cornerstone has now been laid after a long year of planning. "Despite the large number of formal conditions, we still managed to achieve a considerable amount during this time", reports a very pleased Dr. Karl Spanner, founder and president of the company, in his speech to a number of guests from politics and industry. 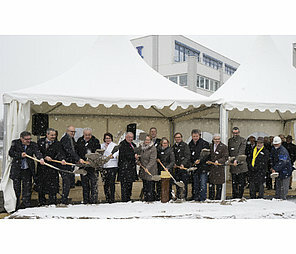 The company employs around 400 people at its headquarters in Karlsruhe and is investing almost 13 million Euros in the building of the Technology Center. "We are active in a high-tech sector and are investing more than ten percent of our turnover in development. The investment is necessary to maintain and expand our position on the world market for precision positioning", continues Dr. Spanner. The building complex covers an area of 9,600 square meters, will provide space for 200 workplaces and also includes laboratories and climatic chambers as well as an auditorium for training events. The development departments, which were accommodated in various different parts of the existing building until now, will be brought together in the new building. It is planned to move into the Technology Center at the beginning of 2017.